For The Byrds' album of the same name, see Mr. Tambourine Man (album). "Mr. Tambourine Man" is a song written by Bob Dylan, released as the first track of the acoustic side of his March 1965 album Bringing It All Back Home. The song's popularity led to Dylan recording it live many times, and it has been included in multiple compilation albums. It has been translated into other languages, and has been used or referenced in television shows, films, and books. The song has been performed and recorded by many artists, including the Byrds, Judy Collins, Melanie, Odetta, and Stevie Wonder among others. The Byrds version was released in April of 1965 as their first single on Columbia Records, reaching number 1 on both the Billboard Hot 100 chart and the UK Singles Chart, as well as being the title track of their debut album, Mr. Tambourine Man. The Byrds' recording of the song was influential in popularizing the musical subgenres of folk rock and jangle pop, leading many contemporary bands to mimic its fusion of jangly guitars and intellectual lyrics in the wake of the single's success. Dylan's song has four verses, of which the Byrds only used the second for their recording. Dylan's and the Byrds' versions have appeared on various lists ranking the greatest songs of all time, including an appearance by both on Rolling Stone's list of the 500 best songs ever. Both versions received Grammy Hall of Fame Awards. The song has a bright, expansive melody and has become famous for its surrealistic imagery, influenced by artists as diverse as French poet Arthur Rimbaud and Italian filmmaker Federico Fellini. The lyrics call on the title character to play a song and the narrator will follow. Interpretations of the lyrics have included a paean to drugs such as LSD, a call to the singer's muse, a reflection of the audience's demands on the singer, and religious interpretations. "Mr. Tambourine Man" was written and composed in early 1964, at the same approximate time as "Chimes of Freedom," which Dylan recorded later that spring for his album Another Side of Bob Dylan. Dylan began writing and composing "Mr. Tambourine Man" in February 1964, after attending Mardi Gras in New Orleans during a cross-country road trip with several friends, and completed it sometime between the middle of March and late April of that year after he had returned to New York. Nigel Williamson has suggested in The Rough Guide to Bob Dylan that the influence of Mardi Gras can be heard in the swirling and fanciful imagery of the song's lyrics. Journalist Al Aronowitz has claimed that Dylan completed the song at his home, but folk singer Judy Collins, who later recorded the song, has stated that Dylan completed the song at her home. Dylan premiered the song the following month at a May 17 concert at London's Royal Festival Hall. During the sessions for Another Side of Bob Dylan, in June 1964, with Tom Wilson producing, Dylan recorded "Mr. Tambourine Man" with Ramblin' Jack Elliott singing harmony. As Elliott was slightly off key, that recording wasn't used. Later that month he recorded a publisher demo of the song at Witmark Music. More than six months passed before Dylan re-recorded the song, again with Wilson in the producer's chair, during the final Bringing It All Back Home session on January 15, 1965, the same day that "Gates of Eden," "It's Alright, Ma (I'm Only Bleeding)," and "It's All Over Now, Baby Blue" were recorded. It was long thought that the four songs were each recorded in one long take. However, in the biography Bob Dylan: Behind the Shades, Clinton Heylin relates that the song required six attempts, possibly because of difficulties in working out the playoffs between Dylan's acoustic guitar and Bruce Langhorne's electric lead. The final take was selected for the album, which was released on March 22, 1965. William Ruhlmann, writing for the AllMusic web site, has suggested the following outline of the song's lyrics: "The time seems to be early morning following a night when the narrator has not slept. Still unable to sleep, though amazed by his weariness, he is available and open to Mr. Tambourine Man's song, and says he will follow him. In the course of four verses studded with internal rhymes, he expounds on this situation, his meaning often heavily embroidered with imagery, though the desire to be freed by the tambourine man's song remains clear." While there has been speculation that the song is about drugs, particularly with lines such as "take me on a trip upon your magic swirling ship" and "the smoke rings of my mind", Dylan has denied the song is about drugs. Though he was smoking marijuana at the time the song was written, Dylan was not introduced to LSD until a few months later. Outside of drug speculation, the song has been interpreted as a call to the singer's spirit or muse, or as a search for transcendence. In particular, biographer John Hinchey has suggested in his book Like a Complete Unknown that the singer is praying to his muse for inspiration; Hinchey notes that ironically the song itself is evidence the muse has already provided the sought-after inspiration. The figure of Mr. Tambourine Man has sometimes been interpreted as a symbol for Jesus or the Pied Piper of Hamelin. The song may also reference gospel music themes, with Mr. Tambourine Man being the bringer of religious salvation. Dylan has cited the influence of Federico Fellini's movie La Strada on the song, while other commentators have found echoes of the poetry of Arthur Rimbaud. Author Howard Sounes has identified the lyrics "in the jingle jangle morning I'll come following you" as having been taken from a Lord Buckley recording. Bruce Langhorne, who performs guitar on the track, has been cited by Dylan as the inspiration for the tambourine man image in the song. Langhorne used to play a giant, four-inch-deep "tambourine" (actually a Turkish frame drum), and had brought the instrument to a previous Dylan recording session. Bob Dylan has often played "Mr. Tambourine Man" in live concerts. The Bringing it All Back Home version of "Mr. Tambourine Man" was included on Bob Dylan's Greatest Hits in 1967 and several later Dylan compilation albums, including Biograph, Masterpieces, and The Essential Bob Dylan. The two June 1964 recordings, one with Ramblin' Jack Elliott and the other at Witmark Music, have been released on The Bootleg Series Vol. 7: No Direction Home and The Bootleg Series Vol. 9: The Witmark Demos 1962–1964, respectively. Outtakes from the January 15, 1965 recording session were released on The Bootleg Series Vol. 12: The Cutting Edge 1965–1966 in 2015. The song has been in Dylan's live concert repertoire since it was written, usually as a solo acoustic song, and live performances have appeared on various concert albums and DVDs. An early performance, perhaps the song's live debut, recorded at London's Royal Festival Hall on May 17, 1964, appeared on Live 1962-1966: Rare Performances From The Copyright Collections, while another early performance, recorded during a songs workshop at the Newport Folk Festival on July 24, 1964, was included in both Murray Lerner's film The Other Side of the Mirror and the DVD release of Martin Scorsese's documentary No Direction Home. A live performance at New York's Philharmonic Hall dating from October 31, 1964, appeared on The Bootleg Series Vol. 6: Bob Dylan Live 1964, Concert at Philharmonic Hall. During his appearance at the Newport Folk Festival on July 25, 1965, after he was heckled by acoustic folk music fans during his electric set, Dylan returned to play acoustic versions of "Mr. Tambourine Man" and "It's All Over Now, Baby Blue"; this performance of "Mr. Tambourine Man" was included in The Other Side of the Mirror. A live version from Dylan's famous May 17, 1966, concert in Manchester, England (popularly but mistakenly known as the Royal Albert Hall Concert) was included on The Bootleg Series Vol. 4: Bob Dylan Live 1966, The "Royal Albert Hall" Concert. Dylan's August 31, 1969 performance of the song at the Isle of Wight Festival appeared on Isle of Wight Live, part of the 4-CD deluxe edition of The Bootleg Series Vol. 10: Another Self Portrait (1969–1971). Dylan played the song as part of his evening set at the 1971, Concert for Bangladesh, organized by George Harrison and Ravi Shankar. That performance was included on The Concert For Bangladesh album, although it was excluded from the film of the concert. Another live version, from the Rolling Thunder Revue tour of 1975, was on The Bootleg Series Vol. 5: Bob Dylan Live 1975, The Rolling Thunder Revue, while electric band versions from 1978 and 1981 appeared, respectively, on Bob Dylan at Budokan and the Deluxe Edition of The Bootleg Series Vol. 13: Trouble No More 1979–1981. "Mr. Tambourine Man" was the debut single by the American band the Byrds, and was released on April 12, 1965 by Columbia Records. The song was also the title track of the band's debut album, Mr. Tambourine Man, which was released on June 21, 1965. The Byrds' version is abridged and in a different key from Dylan's original. The single's success initiated the folk rock boom of 1965 and 1966, with a number of American and British acts imitating the band's hybrid of a rock beat, jangly guitar playing, and poetic or socially conscious lyrics. The single was the "first folk rock smash hit", and gave rise to the term "folk rock" in the U.S music press to describe the band's sound. This hybrid had its antecedents in the American folk revival of the early 1960s, the Animals's rock-oriented recording of the folk song "The House of the Rising Sun," the folk-influences present in the songwriting of the Beatles, and the twelve-string guitar jangle of the Searchers and the Beatles's George Harrison. However, the success of the Byrds' debut created a template for folk rock that proved successful for many acts during the mid-1960s. An excerpt from a 1964 demo recording of "Mr. Tambourine Man" by the Byrds, highlighting Michael Clarke's martial, marching band-style drumming. Most of the members of the Byrds had a background in folk music, since Jim McGuinn, Gene Clark, and David Crosby had all worked as folk singers during the early 1960s. They had all spent time, independently of each other, in various folk groups, including the New Christy Minstrels, the Limeliters, the Chad Mitchell Trio, and Les Baxter's Balladeers. In early 1964, McGuinn, Clark, and Crosby formed the Jet Set and started developing a fusion of folk-based lyrics and melodies, with arrangements in the style of the Beatles. In August 1964, the band's manager Jim Dickson acquired an acetate disc of "Mr. Tambourine Man" from Dylan's publisher, featuring a performance by Dylan and Ramblin' Jack Elliott. Although the band members were initially unimpressed with the song, they eventually agreed to begin rehearsing and demoing it. In an attempt to make it sound more like the Beatles, the band and Dickson elected to give the song a full, electric rock band treatment, effectively creating the musical subgenre of folk rock. To further bolster the group's confidence in the song, Dickson invited Dylan to hear the band's rendition. Dylan was impressed, enthusiastically commenting, "Wow, you can dance to that!" His endorsement erased any lingering doubts the band had about the song. During this period, drummer Michael Clarke and bass player Chris Hillman joined, and the band changed their name to the Byrds over Thanksgiving 1964. Band biographer Johnny Rogan has remarked that the two surviving demos of "Mr. Tambourine Man" dating from this period feature an incongruous marching band drum part from Clarke, but overall the arrangement, which utilized a 4/4 time signature instead of Dylan's 2/4 configuration, is very close to the later single version. The master take of "Mr. Tambourine Man" was recorded on January 20, 1965, at Columbia Studios in Hollywood, prior to the release of Dylan's own version. The song's jangling, melodic guitar playing (performed by McGuinn on a 12-string Rickenbacker guitar) was immediately influential and has remained so to the present day. The group's complex harmony work, as featured on "Mr. Tambourine Man", became another major characteristic of their sound. 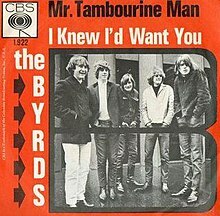 Due to producer Terry Melcher's initial lack of confidence in The Byrds' musicianship, McGuinn was the only Byrd to play on both "Mr. Tambourine Man" and its B-side, "I Knew I'd Want You." Rather than using band members, Melcher hired the Wrecking Crew, a collection of top L.A. session musicians, who (with McGuinn on guitar) provided the backing track over which McGuinn, Crosby, and Clark sang. By the time that sessions for their debut album began in March 1965, Melcher was satisfied that the band was competent enough to record its own musical backing. Much of the track's arrangement and final mixdown was modeled after Brian Wilson's production work for the Beach Boys' "Don't Worry Baby". The Byrds' recording of the song opens with a distinctive, Bach-inspired guitar introduction played by McGuinn and then, like Dylan's version, goes into the song's chorus. Although Dylan's version contains four verses, the Byrds only perform the song's second verse and two repeats of the chorus, followed by a variation on the song's introduction, which then fades out. The Byrds' arrangement of the song had been shortened during the band's rehearsals, at the suggestion of Jim Dickson, in order to accommodate commercial radio stations, which were reluctant to play songs that were over two-and-a-half minutes long. As a result, while Dylan's version is five-and-a-half minutes long, the Byrds' version runs just short of two-and-a-half minutes. The lead vocal on the Byrds' recording of "Mr. Tambourine Man" was sung by McGuinn, who attempted to modify his singing style to fill what he perceived as a gap in the popular music scene of the day, somewhere between the vocal sound of John Lennon and Bob Dylan. The song also took on a spiritual aspect for McGuinn during the recording sessions, as he told Rogan in 1997: "I was singing to God and I was saying that God was the Tambourine Man and I was saying to him, 'Hey, God, take me for a trip and I'll follow you.' It was a prayer of submission." The single reached number 1 on the Billboard Hot 100, and number 1 on the UK Singles Chart, making it the first recording of a Dylan song to reach number 1 on any pop music chart. Critic William Ruhlmann has argued that in the wake of "Mr. Tambourine Man", the influence of the Byrds could be heard in recordings by a number of other Los Angeles-based acts, including the Turtles, the Leaves, Barry McGuire, and Sonny & Cher. In addition, author and music historian Richie Unterberger sees the influence of the Byrds in recordings by the Lovin' Spoonful, the Mamas & the Papas, Simon & Garfunkel, and Love, while author John Einarson has said that both the Grass Roots and We Five enjoyed commercial success by emulating the Byrds' folk rock sound. Unterberger also feels that, by late 1965, the Beatles were assimilating the sound of the Byrds into their Rubber Soul album, most notably on the songs "Nowhere Man" and "If I Needed Someone". As the 1960s came to a close, folk rock changed and evolved away from the jangly template pioneered by the Byrds, but, Unterberger argues, the band's influence could still be heard in the music of Fairport Convention. Since the 1960s, the Byrds' jangly, folk rock sound has continued to influence popular music, with authors such as Chris Smith, Johnny Rogan, and Mark Deming, noting the band's influence on various acts including Big Star, Tom Petty and the Heartbreakers, R.E.M., the Long Ryders, the Smiths, the Bangles, the Stone Roses, Teenage Fanclub, and the La's. In addition to appearing on the Byrds' debut album, "Mr. Tambourine Man" is included on several Byrds' compilation and live albums, including The Byrds Greatest Hits, Live at Royal Albert Hall 1971, The Very Best of The Byrds, The Essential Byrds, The Byrds Play Dylan, and the live disc of The Byrds' (Untitled) album. The Byrds' version of the song appears on compilation albums that include hit songs by multiple artists. Two earlier demo recordings of "Mr. Tambourine Man", dating from the World Pacific rehearsal sessions, can be heard on the Byrds' archival albums Preflyte, In the Beginning, and The Preflyte Sessions. 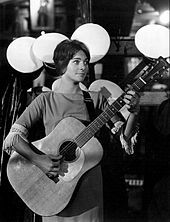 Pictured in 1963, folk singer Judy Collins covered "Mr. Tambourine Man" in 1965. "Mr. Tambourine Man" has been performed and recorded by many artists and in different languages over the years, including at least thirteen versions recorded in 1965 alone. The Brothers Four recorded a commercial version before the Byrds, but were unable to release it due to licensing issues. Notable recordings of the song have been made by Odetta, Judy Collins, Stevie Wonder, the Four Seasons, the Barbarians, and Chad and Jeremy. Other artists who have recorded the song include Glen Campbell (1965), Alvin and the Chipmunks (1965), the Beau Brummels (1966), the Lettermen (1966), Kenny Rankin (1967), Melanie (1968), Gene Clark (1984), Les Fradkin (2007), Bob Sinclar (2009), Jack's Mannequin (2012), and the Flowers of Hell (2012). William Shatner recorded a spoken word cover of the song for his 1968 album, The Transformed Man. A reunited line-up of the Byrds, featuring Roger McGuinn, Chris Hillman, and David Crosby, performed "Mr. Tambourine Man" with Dylan at a Roy Orbison tribute concert on February 24, 1990. This live performance of the song was included on the 1990 box set, The Byrds. At the October 1992 Bob Dylan 30th anniversary tribute concert at Madison Square Garden, McGuinn performed the song, backed by Tom Petty, Mike Campbell, and Benmont Tench, among others. "Mr. Tambourine Man" has been referenced in books and film, including Tom Wolfe's non-fiction novel The Electric Kool-Aid Acid Test, Stephen King's novel Carrie, the film Dangerous Minds, and the documentary film Gonzo: The Life and Work of Dr. Hunter S. Thompson. The subject of the latter film, journalist Hunter S. Thompson, had "Mr. Tambourine Man" played at his funeral and dedicated his novel Fear and Loathing in Las Vegas to Dylan and the song. The 2013 John Craigie song, "I Wrote Mr. Tambourine Man", is about a person that Craigie met in New Orleans who claimed to have written the original lyrics to "Mr. Tambourine Man". The Byrds' version of "Mr. Tambourine Man" was listed as the number 79 song on Rolling Stone's list of the 500 Greatest Songs of All Time, and Dylan's version was ranked number 106. It is one of three songs to place twice, along with "Walk This Way" by both Aerosmith and Run-DMC with Perry and Tyler, and "Blue Suede Shoes" by both Carl Perkins and Elvis Presley. The Byrds' version was honored with a Grammy Hall of Fame Award in 1998, and Dylan's version was honored with the same award in 2002. In 1989 Rolling Stone ranked the Byrds' version of "Mr. Tambourine Man" as the number 86 single of the prior 25 years. That same year, music critic Dave Marsh listed it as number 207 in his list of the top 1001 singles ever made. In 1999, National Public Radio in the United States listed this version as one of the 300 most important American records of the 20th century. In the UK, music critic Colin Larkin listed the Byrds' version as the number 1 single of all time. Other UK publishers that have listed this song as one of the top songs or singles include Mojo, New Musical Express, and Sounds. Australian music critic Toby Creswell included the song in his book 1001 Songs: The Great Songs of All Time and the Artists, Stories and Secrets Behind Them. In a 2005 reader's poll reported in Mojo, Dylan's version of "Mr. Tambourine Man" was listed as the number 4 all-time greatest Bob Dylan song, and a similar poll of artists ranked the song number 14. In 2002, Uncut listed it as the number 15 all-time Dylan song. ^ LaBate, Steve (December 18, 2009). "Jangle Bell Rock: A Chronological (Non-Holiday) Anthology… from The Beatles and Byrds to R.E.M. and Beyond". Paste. Retrieved July 24, 2016. ^ Roger McGuinn (24 Jan 2010). "Ramblin' Jack Elliott: folk pioneer". theguardian.com. ^ Sean Egan (12 May 2011). The Mammoth Book of Bob Dylan. Hachette UK. p. 92. ^ a b Gilliland 1969, show 33, track 2. ^ Beckwith, Harry (January 15, 2001). The Invisible Touch: The Four Keys to Modern Marketing. Grand Central Publishing. pp. 55–. ISBN 978-0-7595-2094-3. ^ Howard, David N. (2004). Sonic Alchemy: Visionary Music Producers and Their Maverick Recordings. Hal Leonard Corporation. pp. 61–. ISBN 978-0-634-05560-7. ^ Dillon, Mark (January 1, 2012). Fifty Sides of the Beach Boys: The Songs That Tell Their Story. ECW Press. pp. 83–. ISBN 978-1-77090-198-8. ^ Johnny Rogan (1998). The Byrds: Timeless Flight Revisited (2nd ed.). Rogan House. p. 417. ISBN 0-9529540-1-X. ^ Johnny Rogan (1998). The Byrds: Timeless Flight Revisited (2nd ed.). Rogan House. pp. 549–549. ISBN 0-9529540-1-X. ^ "Item Display - RPM - Library and Archives Canada". Collectionscanada.gc.ca. 1965-06-14. Retrieved 2018-07-09. ^ "The Irish Charts – Search Results – Mr Tambourine Man". Irish Singles Chart. Retrieved June 6, 2018. ^ Adams, Cecil (April 21, 1978). "Must you get permission to record someone else's song?". The Straight Dope. Retrieved October 1, 2010. ^ Johnny Rogan (1998). The Byrds: Timeless Flight Revisited (2nd ed.). Rogan House. p. 440. ISBN 0-9529540-1-X. ^ Adams, Gregory (September 7, 2012). "Flowers Of Hell Reveal Odes Details". Exclaim!. Retrieved September 9, 2012. ^ Arvind Dilawar (February 20, 2017). "BEHIND THE DEDICATIONS: HUNTER S. THOMPSON". lithub.com. ^ Tuckman, Andrew (July 28, 2013). "John Craigie Has A New Album Out "The Apocalypse Is Over"". Archived from the original on December 2, 2014. ^ Colin Larkin (2000). Virgin All-time Top 1000 Albums. Virgin Books. ISBN 0-7535-0493-6. "1962-66: American Folk-Rock vs. The British Invasion" (PDF). State University of New York at Oswego. Archived from the original (PDF) on June 11, 2011. Retrieved March 19, 2010. "The Byrds: Billboard Singles". AllMusic.com. Retrieved March 31, 2010. "David Crosby". Crosbycpr.com. Archived from the original on June 4, 2010. Retrieved August 21, 2010. Deming, Mark. "The Other Side of the Mirror". AllMusic. Retrieved November 7, 2009. Deming, Mark. "10-5-60". AllMusic. Retrieved October 5, 2010. Eder, Bruce. "George Harrison". AllMusic. Retrieved June 23, 2010. Erlewine, Stephen Thomas. "Bob Dylan at Budokan". AllMusic. Retrieved July 16, 2009. Erlewine, Stephen Thomas. "Bob Dylan's Greatest Hits". AllMusic. Retrieved July 16, 2009. Erlewine, Stephen Thomas. "Bootleg Series, Vol. 5: Bob Dylan Live 1975 – The Rolling Thunder Revue". AllMusic. Retrieved July 16, 2009. "Folk-Rock". AllMusic. Retrieved November 3, 2009. Ginell, Richard. "The Concert for Bangladesh". AllMusic. Retrieved July 17, 2009. Gleiberman, Owen (August 11, 1995). "Dangerous Minds". Entertainment Weekly. Retrieved July 19, 2009. "Grammy Hall of Fame Award". Grammy.com. Archived from the original on July 12, 2009. Retrieved July 16, 2009. Maslin, Janet (August 11, 1995). "Dangerous Minds Film Review; If Teacher Is Pfeiffer, Can Youths Be All Bad?". The New York Times. Retrieved July 19, 2009. McCarthy, Todd (August 9, 1995). "Dangerous Minds". Variety. Archived from the original on June 21, 2009. Retrieved July 19, 2009. McGuinn, Roger. "Byrds FAQ List: What songs did the Byrds make popular?". Ibiblio.org. Retrieved August 21, 2010. "Mojo: 100 Greatest Dylan Songs". Rock List Music. Retrieved May 9, 2010. "Mojo: The 100 Greatest Singles of All Time". Rock List Music. Retrieved May 9, 2010. "Mr. Tambourine Man". ByrdWatcher: A Field Guide to The Byrds of Los Angeles. Archived from the original on January 11, 2010. Retrieved July 19, 2009. "Mr. Tambourine Man: The Byrds". AllMusic. Retrieved July 17, 2009. "Musicians Associated With The Byrds: The New Christy Minstrels". ByrdWatcher: A Field Guide to the Byrds of Los Angeles. Archived from the original on October 28, 2010. Retrieved October 25, 2009. "NME's 100 Greatest Singles of All Time". Rock List Music. Retrieved July 17, 2009. "The Original NPR 300". National Public Radio. Retrieved July 17, 2009. "The Rolling Stone 500 Greatest Songs of All Time". Rock List Music. Retrieved May 8, 2010. "Rolling Stone: The 100 Best Singles of the Last 25 Years". Rock List Music. Retrieved May 9, 2010. Ruhlmann, William. "Mr. Tambourine Man: Bob Dylan". AllMusic. Retrieved July 16, 2009. Russel, Richard E. "Roger McGuinn: Founder of The Byrds". Ibiblio.org. Retrieved October 25, 2009. "Sounds All Time Top 100 Albums & Singles". Rock List Music. Retrieved July 17, 2009. Sutton, Mike. "No Direction Home: Bob Dylan". DVDTimes.co.uk. Retrieved November 7, 2009. "Uncut: Top 40 Dylan Tracks". Rock List Music. Retrieved July 16, 2009. Unterberger, Richie. "The Bootleg Series, Vol. 4: The "Royal Albert Hall" Concert". AllMusic. Retrieved July 16, 2009. Unterberger, Richie. "Bruce Langhorne (1)". Richieunterberger.com. Retrieved July 13, 2009. Unterberger, Richie. "Bruce Langhorne (2)". Richieunterberger.com. Retrieved July 13, 2009. Unterberger, Richie. "The Byrds". AllMusic. Retrieved July 16, 2009. Unterberger, Richie. "Fairport Convention". AllMusic. Retrieved October 13, 2010. Unterberger, Richie. "Folk Rock: An Overview". Richieunterberger.com. Retrieved November 3, 2009. Unterberger, Richie. "Love". AllMusic. Retrieved November 3, 2009. Unterberger, Richie. "Rubber Soul". AllMusic. Retrieved November 3, 2009. "The Witmark Demos". AllMusic.com. Retrieved September 5, 2010.